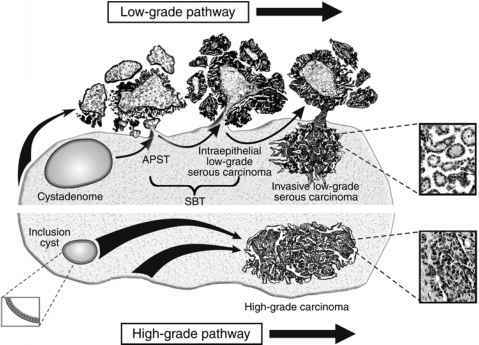 Clear cell carcinoma is an uncommon variant of endometrial carcinoma, and clinico-pathological studies have produced conflicting results regarding its biological behavior, with 5-year survival ranging from 21 to 75% (19-22). Furthermore, in addition to tumors that are pure clear cell carcinoma, clear cell differentiation can be admixed with tumors demonstrating endometrioid or serous components. Although, clear cell carcinoma is often categorized as a Type II tumor both the discrepancy in the biological behavior and its association with endometrioid and serous carcinoma suggests the possibility that it may not fit simply into the dualistic model of endometrial carcinoma.